A WORD TO THE WISE SHOULD BE SUFFICIENT! Fenton Green Concord 9 plate as it came from the factory. Reverse of Green Concord plate having original factory shine. Note That shine continues to the very edge. This is the face of that blue Concord following the makeover. Heat apparently was applied between the ribs on the exterior. Thus the cupping effect-as in an egg plate. Reverse of the blue makeover which appeared for sale on Ebay, Dec. 7, '03. Note the darkened edge and the dull finish, as a result of directly applied heat to induce the flattening process. Here you will find photos of 7 more examples of comparison. In providing these photos of the Concord pattern, we can advisedly explain that ONLY the green plate is KNOWN to be authentic!. That is to say, the green Concord exemplifies the exact factory manufactured plate! It is a prime example of a Fenton plate at its finest, just as they were delivered from the factory. Fenton plates are famous for their flat stature, many times no more than 1 ¼” at edge tip down to table top. (and that does NOT include being forced into a backwards position, as we recently saw in a fake blue Dragon & Lotus makeover). We further emphasize that in owning more than thirty examples of Fenton plates, there are absolutely NONE which appear to be “egg plates” with a visibly cupped, ruffled effect, as you will note is the case with the picture which appeared in an Ebay ad recently. The first of such “after-market atrocities” appeared in a Lexington, KY auction in the early `90's. The auction brochure announced the “first known Dragon & Lotus spatula footed plate.” We drove from San Diego with purchase of this green Concord plate in mind for ourselves, and carried a substantial check with us from Ardonna Bucher to buy this latest discovery in Dragon & Lotus. Well-known dealers along with MANY other knowledgeable collectors in attendance quickly recognized that the so-called plate had been re-heated, and flattened sufficiently, but in the process, the former crease along the bottom of the “former bowl” had not been entirely eliminated. 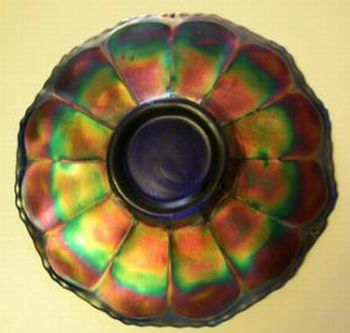 The re-heating by torch, or whatever means is used, had also quite noticeably “roughed and removed the original iridescent shine from the exterior surface of the piece. The application of heat after the original iridescent spraying tends to darken the outer edges of the exterior. That fake sold for a pittance and reportedly ended up in the hands of Roger Gladson, who has always been a Dragon & Lotus aficionado. We hasten to add that the dollar amount in that exchange was negligible. At least that exchange removed it from the marketplace. We have seen other such re-worked Dragon pieces in the years since, as prices for plates have skyrocketed. We have examined one Dragon/Lotus piece during the past month. 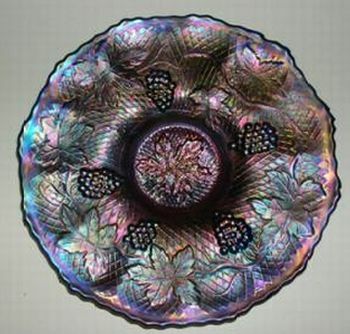 The appearance mirrors the former ruffling from a bowl, as seen in the Concord example pictured. The exteriors after “doctoring by the unscrupulous” were rough in texture and dull in appearance as well. Along with the fact that as these less than authentic examples have and will continue to be infiltrated into the “collecting market system” we all want to feel confident with, acceptance of these forgeries becomes a very real danger to the overall health and outcome of “investing in” Carnival Glass! The unwary newcomer, along with those more advanced collectors who are not familiar enough with the consistency of plate shapes and appearances, can be “taken in” when these fakes appear mixed in with Glass of otherwise reputable nature. When sold through an auction, the price becomes part of the price guides, further misleading those who place mail bids in future auctions, by not noting the questionable character of such a piece! If these pieces are being reworked in the US, they, in most instances are filtering back in from across the Pond, thereby avoiding the authorities who control intrastate and interstate fraud in the US. This eliminates any trace to the perpetrator. The seller of the blue Concord says it and a marigold actually did come from England and he didn't care for the “waviness” in each, as reportedly written to the Roques during the time required to discuss nullifying their bids. The Roques (who have collected for many years) and the seller of the blue Concord piece you see here, came to agreement that the plate looks “somewhat peculiar”, and the sale was negated agreeably, (with a statement from the seller that they would) `take it around for more information' . Fortunately, this instance came to an amiable finish. With more than $1500 involved, the outcome might have been more harmful. It is our sincere hope that those beginners and new-comers to Carnival Glass buying, will be well advised in performing a great deal of research into whatever they decide to purchase. Experience has proven that there is a dark side to even our beloved Carnival Glass! As rare pieces have become the choice for collectors who will pay almost any amount to obtain them, opportunity is being seized to provide unusual “finds”, legitimate or not. Rationale dictates that with some 4000 collectors in the field at all times, since the 1960's, there cannot be an endless supply of “new finds” out there! Since bowls don't bring the enormous prices that plates do, tendency to “fill the gap” by whatever means possible in supplying “would be plates” for the unwary is becoming all too commonplace. No intent to discredit nor implicate any individual is involved in my speaking out about this less than desirable activity. However, the sale of this improper commodity should be brought to light before more unsuspecting, trusting buyers are taken advantage of. Ultimately, this attempt to “make a fast buck” through fraudulent means, will crumble all the work, effort and dedication by those who have gone before us to create the basic attractive qualities of this fine old collectable. 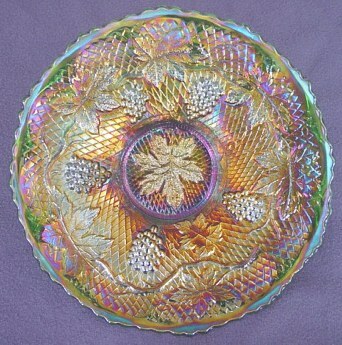 I, for one, as an “old-timer” to collecting Carnival Glass, am not willing to stand by any longer and allow my $3000 Concord plate to be de-valued by someone's attempt to sell a “$150 - bowl - turned - plate - with - ruffling - still - evident - at - half - the - price!” ~~Not without making some loud noises among the crowd, that is! “JUST SAY NO!”~~ Let's wake up, people! Surely I am not the ONLY “long-termer” who's attention has been drawn to this abomination. Now that it is out in the open, what do you say to getting together in eliminating it? The practice has become more blatant in recent years, and unless we agree to eliminating their ugly, unacceptable invasion INTO OUR MIDST………….NO MATTER THE PRICE, there COULD be more to come! The first one in line is Don Grizzle, agreeing that we must inform as many as possible about this plague. Lynda Grizzle echoes the sentiment. If this deceitful practice is NOT stopped now, SHOULD we be fortunate enough to have another generation of collectors coming along behind us, these outrageous makeovers will ultimately destroy the desirability of ALL Carnival Glass! 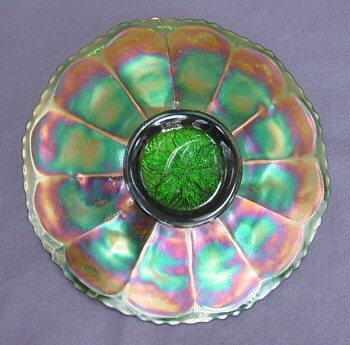 Fenton Glass Co. would NEVER place before the public, such shoddiness. These ugly specimens are a disgusting attempt to defame an extremely worthy manufacturer! I grew up not 12 miles south of this famed factory, and as a child, scoured their dump for perfect little slippers, etc. This was before WWII when the fences were erected around the site. We have been in and out of the factory/museum/showroom dozens of times during my 70 years, to say nothing of our closeness in working with Frank to create Souvenirs for the San Diego/So.CA Conventions. You can be utterly CERTAIN that a higher standard of workmanship than is being displayed in these disgraceful-looking makeovers has been in place since the 1907 timeframe! As a personal friend of Frank M. Fenton, I would venture to say that if asked and shown one of these “would be-plates”, Frank would tell you that “we never made those”. Believe it was Joseph Goebels who said, “the bigger the lie, the easier it is to believe.” Think how many million innocent people were “duped” by the Hitler regime. Have we not learned to search for the truth, before being “taken advantage of ” ?